Whilst researching for last month's Little Terns at Gronant article I came across this delightful book. It is a comprehensive diary with sketches describing three years visiting Gronant during which Judith Samuel spent much time wardening, as well as writing up her experiences and drawing what she saw. It gives a delightful insight into the Little Terns and the life of a voluntary warden, she also describes the other wildlife, and plants, she saw, both at Gronant and nearby sites. So this is the story of how these fascinating, annoying birds have increasingly insinuated themselves into three whole years of my life, years which have seen a growing obsession, particularly with little terns, and with their summer-time life on the dunes at Gronant Reserve, Denbighshire, North Wales. I started with starry-eyed optimism in my own capabilities, believing that with a life-time's interest in birds I was well placed to carry out this self-inflicted research. I soon found out how little I did know, and I continued as an observer until I found that my perspective had subtly shifted to one of a feeling of responsibility, and even guilt, for human interference has wiped out so many species and our best efforts at rectifying that feel so insufficient, sometimes. So I have decided to compile my experiences into a book, using the benefit of hindsight (always a useful quality) to compare the three years. Although written as a diary it has been ruthlessly edited — I went many more times than are actually recorded below — because year after year some things are constant, although others are startlingly different. Many terns are now sitting on nests, male and female take the nursing in turn. All the sitting birds in a locale tend to rise up together in a group, fly around chirruping to each other stretching their wings, then fly like hell straight out to sea to find something to eat. The others sit on the beach for a little when they come in, then eventually go and hover over the nest, often, though not always, going 'wheeeeep' as they descend, have a good look round, sit down, then eventually sink down into what seems like the height of little tern relaxation like slipping into a hot bath. Sometimes they even have a short nap on the nest. As it is a hot day, one incoming tern goes for a bath in a shallow pool, only to be joined by another then another until seven or eight are all luxuriously splashing about together. There is still the odd desperate bachelor who comes in with his sand eel, which he wiggles suggestively at a hapless female, the tern equivalent to the gold medallion and chest hair look. Inevitably rejected he goes round to female after female, only to be told to get lost, though in tern language of course. Now he looks like the nerd at the disco who turned up in a tweed jacket. It's both funny and sad. It's such a lovely day I sit on the beach for quite a while as the birds wheel and shout noisily to each other so that I feel like I'm joining in the conversation. I walk along the beach, it is quiet, birds sitting silently on nests. Then I hear an enormous chattering getting louder and suddenly I am in the midst of a huge crowd of little terns overhead, wheeling and yelling, coming in from fishing duties. They settle on the beach to rest, clean their feathers and have a quick bath. There are many fledglings on the spit at the end so I come back the way I came, along the beach. As I retreat another couple incautiously strides past and I watch in fascination as they get close to the fledglings, when two parent birds, who have obviously been keeping an eye on them, start flying round yelling at them, circling lower and swooping low over their heads, taking the occasional nip. At this point the humans notice the commotion they are causing and retreat in some alarm. P.S. note there are two guided walks around the Little Tern Colony in June, see forthcoming events below for details. Right: RLflagB-LR at Burton Mere Wetlands April 25th (Richard Smith). Both of these birds are first time visitors to the Dee estuary. L//R-RN was ringed in Langstone Harbour on the south coast of England in 2008 and most records for this bird have been from there subsequently. RLflagB-LR is the first Netherlands ringed bird we've logged in the Dee estuary, ringed in NW Netherlands in March 2014. It has also been recorded in both Portugal and France. In late winter and early spring Icelandic Black-tailed Godwits tend to congregate in south-east England (e.g. Thames estuary and the Ouse Washes) and the Netherlands. Being strong flyers they are easily capable of flying from there directly to Iceland, a distance of just over 1,000 miles. Some years, however, they meet strong head winds and 2017 was one of those years and this meant that many birds paused here on the Dee estuary to rest and feed-up for a while before resuming their journey. Hundreds were counted at Caldy, Burton Mere Wetlands and Connah's Quay during late April and by this time they were in full breeding plumage making for a stunning sight. We logged a total of 22 colour-ringed birds. 2013 was another year when the spring migration was delayed by adverse winds and we had a similar numbers of colour-ringed birds then, 23, and it's interesting to compare the two years. As the bar chart shows the make up of birds, in terms of where they spent the winter, was markedly different. 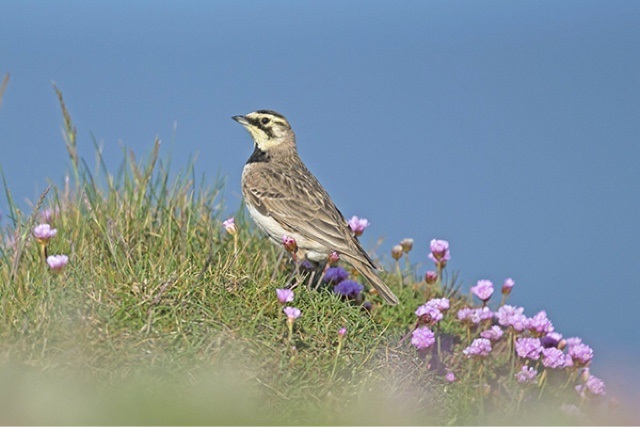 Of, course they may not have flown directly from these wintering areas as many birds seem to relocate in late winter/March – so, for example, many Spanish/Portuguese birds relocate to the Netherlands and many Irish and Dee birds relocate to the SE of England. In 2013 65% of the colour-ringed birds we saw had visited the Dee estuary before (at some time of the year) whilst in 2017 only 32% had visited the Dee before. Perhaps the most interesting difference is the number of records (or ‘godwit days’) with a total of 192 in 2013 and just 30 in 2017. In other words in 2013 many birds were here for several days whilst in 2017 the majority were recorded on just the one day before moving further north - they were obviously in a hurry in 2017. We don't know why there was a difference in the two years but it will probably be something to do with the exact wind direction and strength, and the timing of those winds. 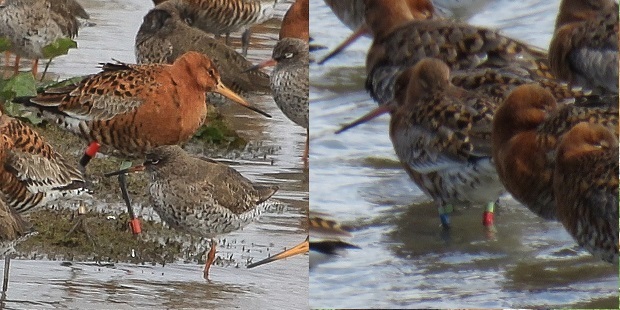 RO-W//W (left) and RBR-GYG (right) at Caldy on April 23rd (Richard Smith), The next day they were in Tiree! There were some interesting movements with two colour ringed birds, RO-W//W and RBR-GYG, present all day at Caldy on April 23rd turning up at Tiree in the Hebrides the next day, presumably having flown overnight. John Bowler, RSPB officer on Tiree, said that there was a record number of Black-tailed Godwits on the island with 2,270 by the April 25th, but again they appeared not to be staying more than a day or two before moving on. So it appears the migration was being slowed but not stopped, and before the end of April we were already hearing that three of the regular Dee Estuary birds had safely reached Iceland with YN-RX arriving in northern Iceland on April 28th and likewise R8-WO on the 30th, whilst YW-GL had made it to south-west Iceland by May 4th. 1. Apart from the godwits themselves the main inspiration for this article came from Graham Appleton's WADERTALES Blog, in particular 'Waiting for the wind - spring flocks of Black-tailed Godwits in Scotland', March 2017. 2. Thanks to all those who sent me their colour ring records this spring including: Steve Hinde, Rick and Elis Simpson of Wader Quest, Richard Beckett, Matt Thomas, Colin Schofield, Peter Haslem and Les Hall. 3. Thanks to all those who sent us feedback: Jenny Gill, Pete Potts, Raymond Duncan, Vincent Lelong, Phillipe Delaporte, B��var ��risson and Jos Hooijmeijer. 4. See article - Black-tailed Godwits at the 'Caldy Wildfowl Collection' April and May 2013, August 2013 Newsletter, www.deeestuary.co.uk. There are several colour ringing schemes, I am happy to either send in the details myself or advise which scheme the bird you've seen belongs to. 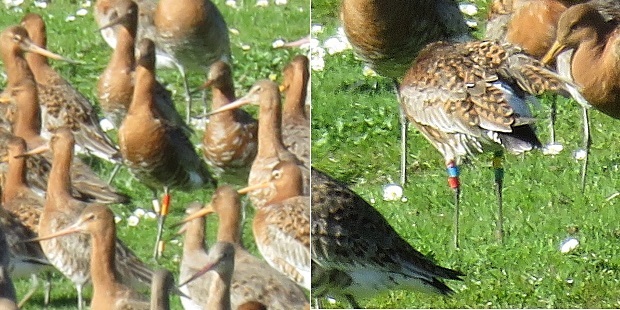 I can also email you the 'Illustrated Key For Black-tailed Godwits' Colour Ring Schemes'. The ringers and people administrating the schemes are all volunteers, feedback is usually fairly prompt but during busy times can take a few weeks. The big story of the month must be the confirmed breeding and successful hatching of Cattle Egrets at Burton Mere Wetlands, there were a total of six adult Cattle Egrets there and this follows the influx of this species into the country late last year (see Egrets Galore). 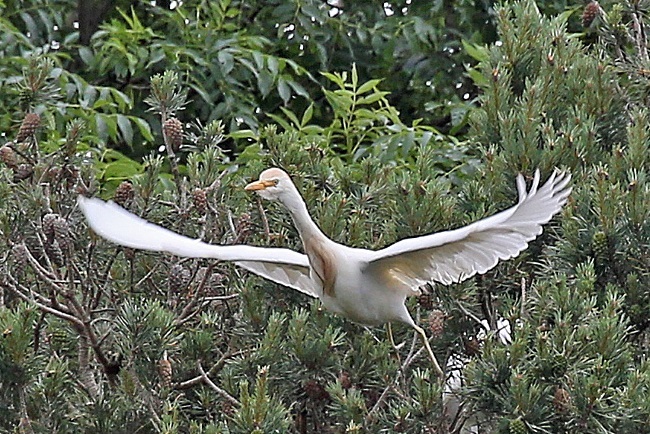 The first and only other confirmed breeding of Cattle Egrets in this country was in 2008 in Somerset, following an even larger influx in 2007/8. 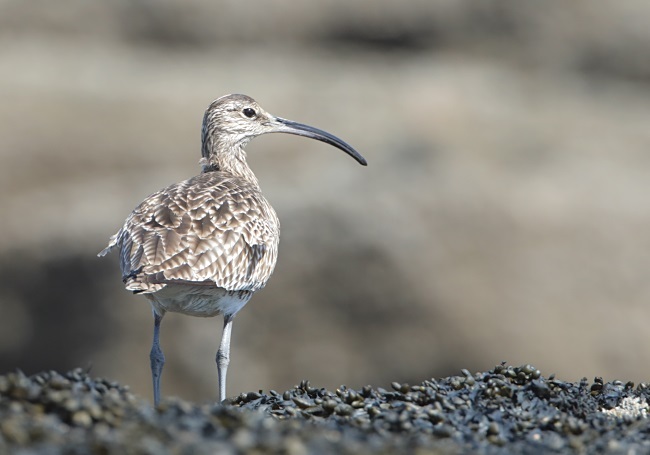 The only other breeding probably took place in the south-west of the country in 2009 when a pair was seen with a fledged young. 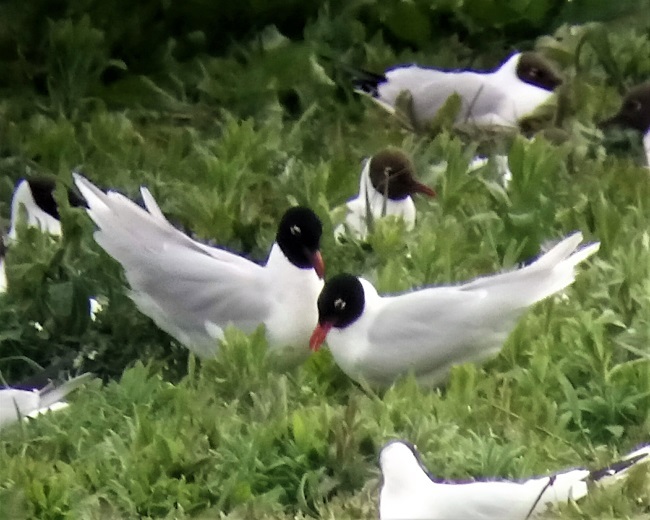 Looking at the photo below it seems that Mediterranean Gulls may also be breeding at Burton Mere Wetlands, although I haven't heard any confirmation of that. May is often a good month for rarities but this year was exceptional with: a Spotted Crake at Red Rocks (1st), a Sub-alpine Warbler at Red Rocks (10th), a Shorelark on Hilbre (14th to 25th), a Hoopoe at West Kirby (16th), a Buff-breasted Sandpiper at Burton Mere Wetlands (19th to 21st), a Turtle Dove at Red Rocks (22nd to 24th) and a Roseate Tern off Leasowe Lighthouse (23rd). The highlight of the wader migration were seven Curlew Sandpipers over Hilbre on the 13th which we think is probably a record high number for spring on Hilbre, there were a further two singles seen during the month. There was a total of eight Little Stints spread right across the estuary including Gronant, Burton Mere Wetlands, Hilbre, Hoylake and Meols. As usual Heswall was the best place to see Whimbrels and there was a massive count of 131 there on the 2nd. With good weather virtually all month the Little Terns at Gronant got off to a very early start with the first egg hatched on the 16th, which is likely to be the earliest ever recorded. Unfortunately some nests were lost during the high tides at the end of the month, but it is still very early in the season and surely they will re-lay. Other highlights included 17 Whinchats at Burton Marsh on the 1st, several Grasshopper Warblers around the Boathouse Pub and Heswall Golf Course area of Parkgate and a Blue-headed Wagtail at Leasowe Lighthouse on the 22nd. Many thanks go to Juilie Rogers, Steve Dewsnap, David Huntingford, Mal Sergeant, Eddie Williams, Derek Bates, Jane Turner, Steve Hinde, Mark Turner, Matt Thomas, Chris Butterworth, Paul Shenton, David Leeming, David Haigh, Jeremy Bradshaw, Alan Hitchmough, Carole Killikelly, Les Hall, Steve Williams, Dave Edwards, Gail Wilson, Richard Beckett, Paul Mason, Elliot Monteith, Karen Leeming, Paul Lee, Roy Lowry, Paul Vautrinot, George Knight, Neil Mack, Linda Platt, Richard Whitby, Neil Mcmorran, Damian Waters, Allan Conlin, David Thompson, William Boyce, Mark Gibson, Ian Fleming, Dan Trotman, Tom Giles, Rob Morsley, Graham Connolly, Keith Scovell, Chris Wilding, Henry Cook, Derek Williams, Ian Cotterell, James Smith, Clive Ashton, Steve Hasell, Howard Garner, Colin Schofield, Andrew Wallbank, Neil Montieth, Sue Seddon, David Wood, Nick Carr, Deborah Evans, Ian Fewtrell, the Lighthouse and Wirral Birding Blog, the Dee Estuary Wardens and the Hilbre Bird Observatory for their sightings during May. All sightings are gratefully received. As far as some waders are concerned the spring migration is still under way early in the month, in particular look out for flocks of Sanderling on their way from West Africa to Greenland. In contrast the second half of June marks the start of the return migration and we may see Common, Green and Wood Sandpipers finishing their breeding season early, as well as a start of more common waders, such as Redshank, building up in numbers. Gulls numbers will also increase and should include Mediterranean Gulls still in full summer plumage. June often sees an influx of immature Spoonbills and last year we had a record seven. It is usually a particularly good month for rarities and over the past three years these have included Broad-billed Sandpiper, Stone curlew, White-winged Black Tern, Red-necked Phalarope, Serin and Bee-eater. 24th June, 11.54hrs (BST), 9.7m. 25th June, 12.45hrs (BST), 9.7m. 26th June, 13.35hrs (BST), 9.6m. 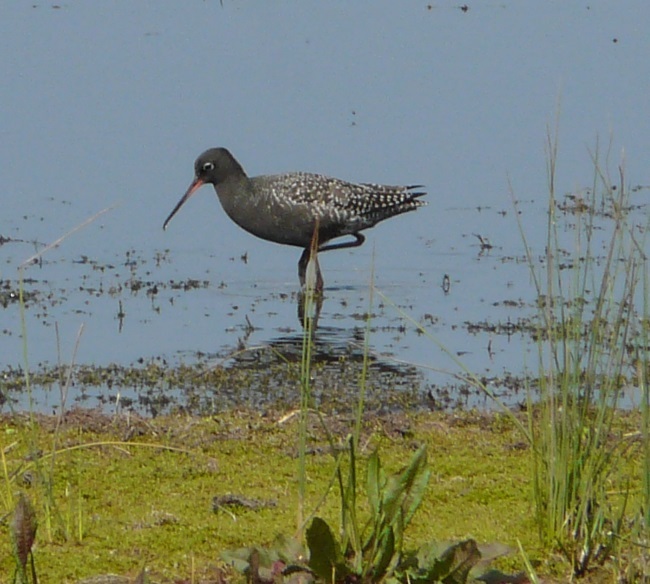 Tuesday 13th June, Sunday 2nd July and Tuesday 11th July, Wildlife Wander at RSPB Burton Mere Wetlands. Price: Free (normal reserve entry charges apply to non-members). Join one of our friendly, knowledgeable volunteers for a leisurely amble around much of Burton Mere Wetlands, including the unmissable viewpoint at the end of the Hillfort Trail on Burton Point. Take in the sights and sounds, learn more about the wildlife that thrives here, the work we do to give nature a home and the remarkable history of the estuary. Great for first time visitors or those looking to brush up on their identification skills; with constant changes as we move through the seasons, it's impossible to predict what might be seen. Summer may be a quieter time for birds since they finish defending territories as breeding season ends, but the growing avocet chicks and fledged little egrets and herons loafing close to the hides are great to watch. Warm sunny days will bring out the various dragon and damselflies that make their home on the reserve, along with butterflies and basking common lizards! Some birds begin their return migration just as we are getting settled into summer so sometimes unexpected birds may be found. No booking required, just turn up on the day. A reasonable level of fitness and sturdy footwear are required. Walks typically last up to 3 hours, weather permitting. Ring 0151 353 8478 for further details. Wednesday 14th June, Seabird Wednesday at Gronant. Join the Wardens on a guided walk of the Little Tern Colony at Gronant Sand Dunes and learn all about these fascinating seabirds. Bring sturdy shoes or boots, Gronant sand dunes are exposed to the weather coming off Liverpool Bay so bring suitable clothing. Meet at the car park opposite the Crofter’s Cafe on Shore Road, Gronant. This event is free and no need to book, for further details ring 01352 810614 or 01745 356197. Friday 30th June, Seabird Friday at Gronant.